Yet another attempt to practise making caramel. Sometimes I wonder why I bother practising when it is just sugar, which is not a big friend. It gets worse when the people who received the cake commented that it was too sweet. I had already reduced the sugar used in the cake and the caramel, let's just said it was a fraction of the original recipe. Instead of making a big 10-inch cake, I made 3 loaves. I reduced sugar for the cake by one-quarter cup and made only half of the caramel. The syrup was then shared among the 3 loaves and it was still sweet for that friend. Guess her tolerance for sugar is way lower than mine, or have I began to accept more sugar now? :S The perils of baking, perhaps? In a recent community baking event, I had the opportunity of making caramel on my own. 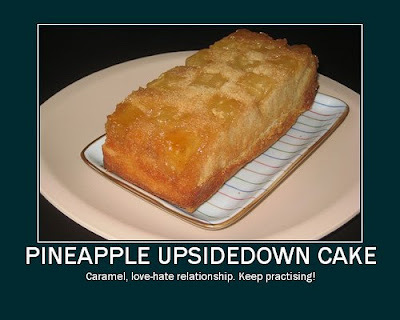 After watching a few episodes (on cable tv) featuring caramel, I thought I could finally put that "knowledge" to test. However, I failed a few times. Thankfully, P and J were on hand to share their knowledge. Lo and behold, that attempt proved successful! It was such a joy to see the amber syrup. The downside of knowing this is -- I keep looking out for recipes that feature caramel! Gosh, it's nothing but sugar and butter ... I found this information really useful and close to what we did. Since I've been wanting to try to make my family's favourite snack, I had invested in a packet of popcorn, the DIY kind, that is. From the instructions, it looked pretty easy. And it was! 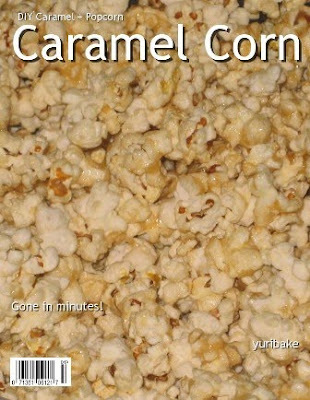 I didn't believe that the children would take the bland popped corn (while waiting for the caramel to be done). I followed this recipe in making the caramel, which is slightly different from the method I had tried earlier. The popcorn didn't last very long, they were gone in minutes. One packet of popcorn will make many servings. For all of us living in this part of the world, we are accustomed to the humid weather. While the rest of the world has four seasons to cope with, we just have to deal with "summer". As the Chinese saying goes, 长年是夏，一雨成秋(summer all year round, with rain comes autumn). With the effects of global warming, it sometimes gets a little unbearable. It appears that whole (young) coconuts are fast becoming an ubiquitous items in supermarkets. Even my regular vegetable stall at the market sells them. The stallholder even taught me a trick or two about them. To my dismay, I don't seem to remember any of the tips :( But I can always count on him to pick a good coconut for me. I came across the recipe for coconut jelly a while back. With two coconuts in my fridge, I decided to give it a try. Afterall, I have a ready supply of agar agar (gelatine) packets calling out to me. As I had forgotten to get pandan leaves, I added a dash of pandan extract. That explains the greenish tinge. This is one refreshing dessert, especially if it's served right out of the fridge. We had a family barbeque and I served this. It didn't go well with the children as fresh coconut is probably a new flavour to them? The adults enjoyed the coolness the jelly brought. 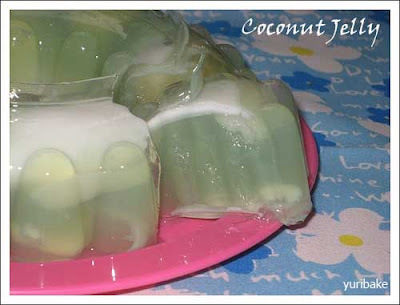 The next time I make this, I must remember to get pandan leaves so that the jelly will remain clear and transparent. My family loves ribs, especially succulent and tender ones. Guess it's due to tasting ribs from a certain family restaurant that sharpened our palates to this texture. I have since been trying to recreate this particular bite at home. 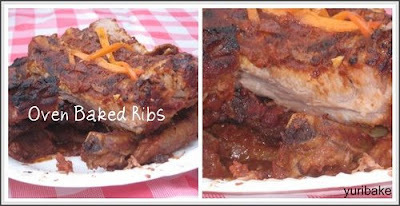 I made this Oven Baked Ribs for a family gathering a while back (yes, backlog of photos and posts). I wouldn't say I had achieved the desired "bite". But gosh the ribs were yummy and they were gone in no time! Fortunately, I made almost 2kg of it and there were enough "leftovers" for my two sisters-in-law to bring home. Not one to give up, I tried making this ribs in a different way recently. I used a trusty, multi-purpose claypot and (semi) braised the ribs. What d'ya know? I achieved the texture I was looking for and hubs agreed too. However, I realised that the tomato paste/puree made a big difference. I shall not use local brands for western cooking. On the cooking method, somehow baking meat for an extended period just doesn't sit well with me. Someone remarked "crazy... weather is so hot, bake in oven for one or two hours ... kitchen will overheat..." I'm glad I used the claypot. I wanted to remember today with a post and a bake. What is so significant about today? Well, it's the total solar eclipse, a precious and special event. I'm not into astronomy or any scientific studies. But it is such a phenomenon, that the Sun, Moon and Earth are in a straight line. As I was at work, I could only rely on certain websites for updates. I'll catch the recording later. 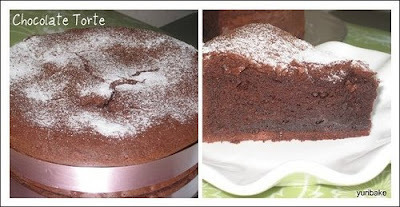 As for the bake, I chose a "dark" cake that I had baked several weeks ago. I was tired of baking the same thing and someone highly recommended HHB's Chocolate Torte. Apparently, it's a form of "comfort food" for some, chocolate lovers, I suppose. I like this cake, but my attempt was underbaked :( The sides of the cake caved in so I had to hide it. Most of the nice ribbons I have are too wide and the only ones (with suitable width) are all plain. Must invest in nicer ribbons (note to self). I thought it tasted a lot like brownie, but better, and my son loved it. I had followed HHB's recipe closely but I added some cointreau for kicks. 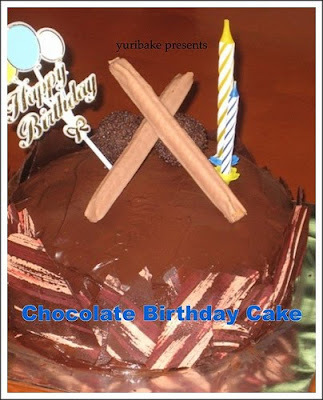 This is one cake I will bake again. Besides, I have all that chocolate waiting to be used, including some Belgium (couverture) chocolates. Yums! Yes I'm back to blogging, but not sure for how long. I've been baking all these while, just haven't updated this space due to a variety of reasons. Having nothing to blog about (at least "in public") was a major reason. The other reason is of course due to laziness and the lack of nice photos. Besides, I kept baking the same few recipes. However, I am continually inspired by the beautiful photos and wonderful experience by various bloggers. 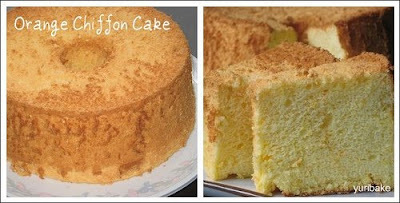 Chiffon cake is one of my favourite to bake when I have time. I don't usually enjoy baking chiffon cakes at night as the cooling process takes too long, by which time I can hardly keep my eyes open. I'm home today as my son has fever. With news reports that say "1 in 2 flu cases is H1N1" don't necessary sit well with anyone. I was most recently a "close contact" of someone who tested positive and had to observe Leave of Absence of 7 days. During the initial days, I was rather worried that I may catch the virus. Not so much worried for myself but more for the children. What if they had to suffer as a result? Seeing my poor boy weak and sick yesterday brought on some strange feelings. He has grown significantly and he is not a small-sized child. He is big for his age and seeing him so weak made me feel helpless. He's no longer the tiny tot who relies on mummy for every little need. My boy has grown up. His fever hovered between 39.1 and 39.8 deg C last night.Thankfully, after the first dose of medicine this morning, the fever subsided. He looked visibly healthy today, compared to yesterday. He was able to eat, which should be the case since he did not eat much yesterday. I took the chance to bake, on seeing that he was a little better. Since all I had were oranges, it would have to be orange chiffon. I have learnt that my weakness in the chiffon cake process was in "baking", ie, my cakes were mostly underbaked. I've recently discovered that for my oven, it would ideally need at least 55 minutes of baking time (at an average temperature of 160 deg C). I must have been muddled-headed today and forgot how long time has elapsed. I thought I had overbaked the cake but it turned out alright, thank God. Looks like I have to seize whatever opportunity there is to keep practising chiffon cakes. For my next try, may be a rose or bandung flavoured cake. J had kindly helped me get a bottle of rose water which I have yet to try. Wonder what else can rose water be used for? It's been a long time and there was so much going on in and around my life that I could not find time to blog. I have been baking very much the same cakes -- banana cake, blueberry yogurt cake -- that I find no meaning in writing nor posting photos. I did, however, attend a series of baking classes in April where I learnt more about mousse and buttercream. So, I need to go beyond my comfort zone of just baking a cake. I have come to realise that the "limitations" are those I set in my mind. For our wedding anniversary, I decided to try making lemon mousse to go with an almond sponge cake. The mousse was a bonus recipe which is really a simpler version of what we did in class. There was no Italian meringue to make, phew! 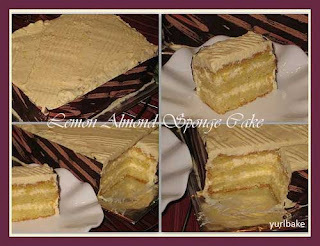 The sponge cake recipe is a real delight and has become one of my favourite cake with nuts. As expected, the cake is very "grainy" as I had used finely ground almond. I had tried the same recipe with walnuts and pistachios, all garnered good reviews with request for recipe. Unfortunately, I am not at liberty to share it. With Mother's Day round the corner, I may just try to see if I can whip up another cake. As for photos of the cakes I did from baking classes, that will be in later posts, perhaps.